The funnier albeit much-less-scary half of the famous monster duo, Mike Wazowski ends up with quite an extensive resume by the time Boo returns and Randall gets banished to the human world. In addition to helping save little Boo, Mike foils Randall and Mr. Waternoose's plot, discovers a much more lucrative (and enjoyable) energy source than screams, and runs away with that snake-eyed vixen Celia. But rarely do monsters (or humans) make such an impact without preparing properly first. We imagine the process is a grueling one, with elite student societies to edge one's way into, like the YSA (Young Scarers Association), the SMS (Small But Scary), and the CC (Camouflage Club). And while you maneuver that volatile web of cliques, try your best to maintain a 3.0 grade-point-average in classes like Advanced Tip-Toeing, Scare Ethics, and Roaring 101. 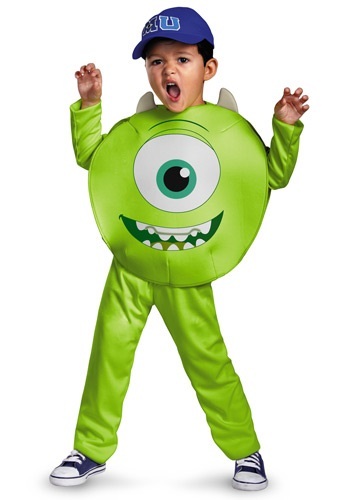 Mike did just that at Monsters University, and if your little one has similar scary aspirations, we have a costume just for him. Give your little monster the confidence he probably needs during this transitional phase through, first of all, lots of positive reinforcement (it's a vulnerable time!). This officially licensed Toddler Classic Mike Costume will help him fit in, though, just like Boo at Monsters, Inc. Role reversal! Running around Monsters University with his cool new "MU" hat and pizza-sized eyeball, there's no way he won't attract the beady eyes of some friendly monsters. Just keep on him about the books!